With any luck, a cat won’t hop in here with us. New to my blog? Pick a few “Topics” like Favorites or Classics or Fiction & Essays or Friday Food Thing. Then “Sign Me Up” and tell your friends. While you’re visiting, explore the American Impressionist & Recipedujour links in my Blogroll. I remember writer Ray Bradbury’s past television series, The Ray Bradbury Theater, in which, at the beginning of each episode, Mr. Bradbury ascends to his studio in a rickety elevator, unlocks a door, and steps into his mysterious writing chamber. The room is filled with curiosities of all sorts; knickknack items crowd every square inch of shelf space and windowsills. While the TV show’s credit music dies down, Mr. Bradbury peers around the room through his thick glasses while he tells us he’s waiting for inspiration. That broken clock over there or that odd piece of jigsaw puzzle here; or perhaps the cracked African voodoo mask in the corner sitting next to a mirror in whose reflection dangles a Cupie Doll hanging from the ceiling. He feels a story in that one, he tells us. A story waiting to be written if he but listens. Well, I’m listening right now, searching for a thread of inspiration or direction, but all I hear is my computer’s cooling fan and a strange thumping outside my window. I get up from my chair and press my face against the glass. A shadow brushes the window pane one-eighth of an inch from my eyes. A dark hand thrusts through the dirty glass, grabs me, pulls me through the tiny window without my body even breaking it. Cold air fills up my lungs and – – shivering in an unexplainable chill and surrounded by a musky odor like damp wolf hair – – I am whisked effortlessly up into a treetop. From there I see a light shining from my bedroom-office window. Is that me looking through it? Ray Bradbury passed away in 2012. He was not only one of my favorite writers but an inspirational figure to thousands of young writers everywhere. I am grateful he left behind such a rich legacy for us to enjoy for centuries to come. One day while cruising Lake Whitehurst in my “Molly B” kit-built canvas canoe, I discovered an errant duck egg sitting in an abandoned nest on a weedy shoreline. There were perhaps six or seven broken and hatched eggshells scattered about. Later, library research revealed that a ninety-six degree incubation temperature was a great start for wannabe ducking hatchlings. Eventually a tiny duckbill poked out from the carefully manipulated and temperature-regulated heating-pad-environment egg. Two hours later a fuzzy “Duck-Duck” emerged — a bizarre chromosomal mixture of wild Mallard and white domestic genetics, no doubt the end product of confused parents. Duck-Duck immediately “imprinted” on my physical characteristics and in no time at all I was a — Mom! Duck-Duck’s education included long swimming sessions paddling within Molly B’s wake. But no matter how hard I tried to ditch the duck in the months to come, no matter how fast I paddled, Duck-Duck managed to keep up. Mom became quite fond of Duck-Duck; even our dog, Yankee, accepted this innocuous, feathered sibling as an equal at the dinner bowl. For nearly a year Duck-Duck protected our back yard from whatever encroachments and obtrusions Yankee — in her old age — neglected. Then one day I waddled Duck-Duck over to the Norfolk Botanical Gardens Petting Zoo (less than 1/2 mile away), where he was an immediate hit with the clamoring kiddies. Cleverly, and unnoticed by the petting zoo’s curators, I gently placed the too-overweight-to-fly Duck-Duck inside the duck pen and walked home. As his panicked quack attacks succumbed to distance, I knew I had moved through another important part of childhood: it was time to leave the duck behind. That night Yankee waited patiently beside her dog bowl for her friend, but after a while she made the dog food disappear. Update: Five decades later when eyeballing multitudes of ducks as they swim past my dock, I often catch myself wondering about Duck-Duck. Could it be that one over there with the weird mixed coloring is a descendent of a Norfolk Botanical Gardens Petting Zoo escapee? The other day while sitting on the dock just after sunrise, I heard and then saw a bass boat stepping down off its plane way up at the mouth of my cove. After a while the boat trolled into view around a weedy point. Sitting in the rear seat was a young girl, maybe six or seven years old. She was so small that her pink tennis shoes dangled a foot above the carpeted platform of the boat. While dad manipulated the trolling motor and cast his lure into the edges of the weeds, the little girl was carefully watching him and casting her own lure in and out of tight areas of cover. I remember how excited I always became when Grandpa announced he’d be taking me fishing on the following day, and I recall how those long hours leading up to a sunrise fishing trip dragged on and on forever just like Christmas Eve. As I watched the young girl casting out her spinner bait and retrieving it slowly, I felt a connection to something infinitely pure, and for the briefest glimmer of time I was allowed to experience a gift: sharing the exact same thrill the young girl had surely felt when dad plopped her down in the boat and headed out into a day that would be profoundly remembered by the grown-up girl years later when she headed out with her own child for a glorious day of fishing with mom. Note: because my friend, Rich knows how much I enjoy fishing, and because he remembers the Little Girl Fishing story of mine from more than a decade ago, he sent me this outstanding viral video link: Little Girl Catches Bass on a Barbie Fishing Pole is what fishing is all about. Thank you, Rich, and thank you Grandpa. 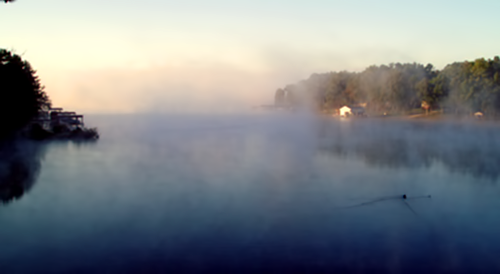 Mornings are something special at Lake Gaston when nighttime temperatures drop below the lake’s surface temperature; where cool of fall meets warmth of summer, fog happens. The period of time just before the fog moves on is transformational: in a matter of minutes visibility can increase from zero to hundreds of yards, a dawning of distance and acuity, reality and rebirth. For someone like me who swears that McDonald’s Egg McMuffin is one of the finest fast food items offered on this planet or elsewhere, I applaud McDonald’s latest marketing announcement that breakfast will now be served all day long beginning October 6, 2015. Will breakfast items be prepared in bulk during regular breakfast hours and then nuked later in the day as they are needed? And if not—since McDonald’s fish sandwich is the second finest fast food item offered on this planet or elsewhere—will the McDonald’s afternoon menu eventually be offered during normal breakfast hours? Finally, by golly, is there any chance McDonald’s will offer to compensate me for “McBreakfast Yum your tummies all day long” marketing rights? All I gotta do now is wait a bit before I drive into town and buy a McDonald’s Egg McMuffin for lunch. I do not normally run around naked at 2 AM with the blue beam of a flashlight sweeping my roofline and treetops for the crush of a massive fallen tree. An hour earlier I had been reading peacefully in bed, my softly backlit iPad wooing me back to sleep. That was when The Crash of Tuesday Last yanked me screaming from bed while outside the terrifying death-groan of an oak tree ripped chunks of timber and brick masonry from my rooftop. Except for the naked part, I must have looked like a bare-footed Agent Mulder in an X-Files episode searching the treetops in the dead of night within the beam of an FBI-grade Magna-Light. Rain fell. I was cold. Thunder grumbled overhead. I found nothing. The next morning, with the benefit of a spectacular sunrise, I searched again. I found neither fallen tree limbs nor damaged roof. Just another nighttime mystery. Until yesterday afternoon when I opened the door to my spare bed/storage room and discovered my antique glass collection scattered on the floor. Errant pieces of of dark Depression Glass and shards of crystal bowls that had been gleaned through decades of countless yard sales and impromptu garage rummage events… gone, just like that. Turns out that an aging, wall-mounted bookcase built in 1982 had finally decided it could no longer support the weight. Some things are not meant to be. But the good new is part of my collection survived, along with idiotic mementos from my fragmented past. How about that Pat Boone Speedy Gonzales record album? I won it as a prize back in the day, and managed to get it autographed by former Chief Justice, Earl Warren. My family was living near Athens, Greece at the time, and I was a Boy Scout competing in a swimming completion, and… well, that is another story for another time.